Jawa motorcycles are solidly built and simple, there isn't much that can break on them. Yet, not much different from any other bike, they have a few design flaws. One of them is the clutch. The clutch on my Jawa was terrible when I bought the bike that had been sitting untouched in a garage for ten years. It was rough, tough, rattling, grabbing, vibrating, humming, chattering... at moments almost unrideable! I know of two other Jawas besides mine, and they both have the same problem, although to less extent. Their owners have learned to live with it. 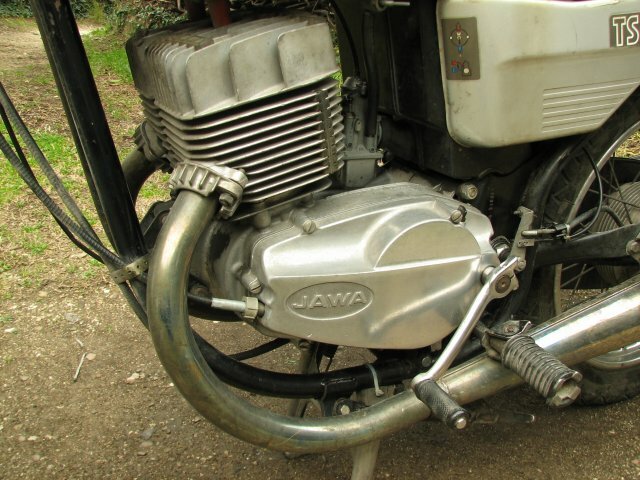 If your Jawa engine looks like on the picture above, and you think that it is normal that the clutch is a bit naughty, believe me, it can be cured. Trying to put things right, I have first tried half a dozen of different grades and makes of gear oil, to no avail. I have tried sanding the plates. It helped, somewhat, but was short lived (lasts for a few hundred kilometres). I have ordered a complete new set of clutch plates, the story of short lasting sanded plates repeated. It is hard to believe that such a small piece can cause so much trouble. It is no oil seal, as it might seem. It is a damper, something elastic that squeezes the plates gradually and absorbs the vibrations when the clutch is being engaged. In the workshop manual it says that the O-ring has to protrude 0.3 - 0.5 mm out of the groove. The manual doesn't say that the O-ring has to be very elastic, but it has to if it is to be any good. My trial and error procedure repeated again with the O-ring. First I had ordered a new O-ring from www.mz-b.com, and it worked! Sadly, not for very long, a few months, barely. I had tried stuffing all sorts of materials in the groove. Some of them where more successful than the others, but none were perfect. It would either harden and compress over time (especially during the cold winter months), or swell in the oil bath and prevent the clutch from disengaging fully. It turned out that the right material is easy to obtain and to shape it appropriately is not any harder. Visit any car parts store and ask them to show you some general use silicone based sealant. 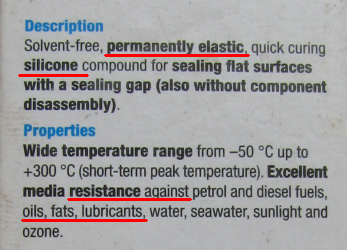 Look for the properties permanently elastic and oil and heat resistant. They usually all are. To make a damper out of the stuff is easy. The tolerances are not tight, and it doesn't have to be a closed ring either (remember, it is not an oil seal). The dimensions of the original ring are 120 x 3 mm. 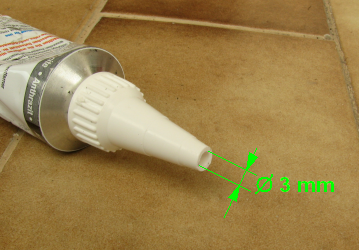 Usually, a conical applicator that can be cut to suitable size is provided with the sealant. Cut it so that the opening at the top is exactly 3 mm in diameter. Prepare a flat, clean and smooth surface, at least 380 mm long (120 mm x Pi). You might want to oil the surface lightly as you don't want the new ring to stick to it. 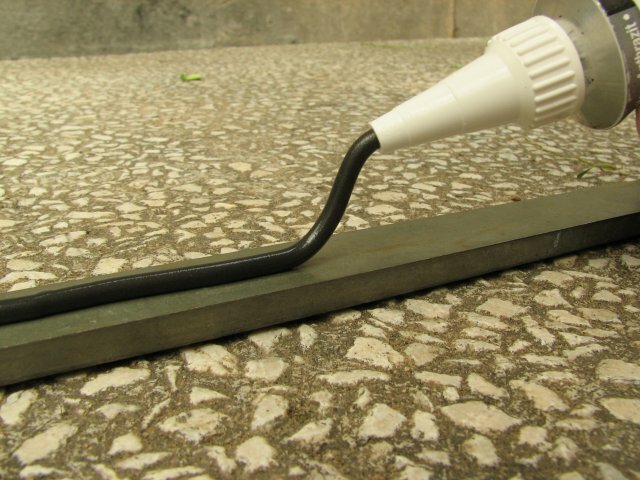 Squeeze the sealant through the applicator and let it fall freely onto the surface from the height of about one to two centimetres. Move along the surface to obtain a cord 380 mm or longer in length. It takes some practice to make it perfect. Don't worry if you cannot keep the thickness consistent. Make the cord long enough so you can cut out the segments that didn't turn out well. As it is not an oil seal, our ring doesn't have to be a ring at all. It can be composed of many segments and it will not affect its functionality in any way. Now let it harden. Don't be impatient, let it cure completely and then wait some more. A couple of days is not too long. Finally, just peel it off the surface and cut it to the measure (377 mm, precisely). Now do a test ride and surprise yourself with your new bike. In my case, it actually felt like a different bike. The clutch is now finely modulated, it never grabs, and unique Jawa semiautomatic shifting is a joy. It's been over a year now since I have installed the new damper in my Jawa, and the clutch is still silky smooth like the first day. The author has written these instructions based on his own experience and in hope that they will be useful, but without any warranty that they will be applicable to any particular case! Use these instructions at your own risk! Author denies any responsibility for any damage that may be caused by obeying these instructions. Some basic knowledge and experience in repairing motorcycles is assumed. Motorcycles can be dangerous machines and serious injury or even death may result if modifications and repairs on vital parts are done improperly. Consult a professional if in any doubt! Simpy incredible, but magic, as you say, J got a new bike (TS 350 1991, 7500 km), thanks very much for this tuto, you\'re the only one person on the net who explain this problem, bravo ! ! excellent article. my clutch will not disengage. clutch mechanism on righht side moves freely. bike jawa 640 any ideas? 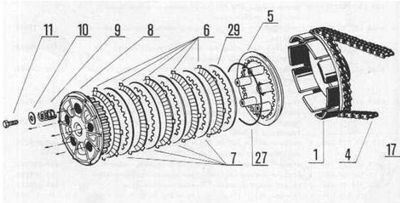 Admin: If the whole clutch mechanism moves then it is not assembled correctly (loose bolts?). If only the central piece moves then it is either not adjusted (see the manual) or the push rod underneath it is broken or missing.